NAM Report Drives Home Need for Increased Infrastructure Investment. Numerous news outlets and local radio programs across the country highlighted the report’s findings, including The Wall Street Journal, The Hill, Politico, Roll Call and the Pittsburgh Post-Gazette. NAM Board Member and Neenah Enterprises, Inc. President and CEO Thomas Riordan told The Wall Street Journal that transportation congestion raises his Neenah, Wis., foundry’s overall costs by 1 percent annually. “This is a hidden tax that we’re paying many times over,” he said. “The infrastructure has gotten bigger, and that means you need more funding to maintain it,” added Volvo Group North America Senior Vice President of Public Affairs Susan Alt. Beyond its core findings, the report reveals a decade of troubling trends, such as a 3.5 percent drop per year in the volume of highway, road and bridge investments and sharp decreases in mass transit, aviation and water transportation infrastructure investment. “The United States is stuck in a decade-long period of decline that will eventually harm job creation, future productivity and our ability to compete head-to-head with companies all over the globe,” said NAM President and CEO Jay Timmons. He called on Congress to consider this new report and, consistent with the NAM’s Growth Agenda, pass legislation to help fund transportation and infrastructure. For more information on the report, click here. The findings arm NAM members and association partners with another tool to engage federal, state and local officials about this problem and spur action on long-term solutions to modernize and improve our nation’s aging infrastructure. Details: Rosario Palmieri, (202) 637-3177 and Robyn Boerstling, (202) 637-3178. The Treasury Department on September 22 issued regulatory guidance to discourage so-called corporate inversions occurring after September 23, 2014. The guidance attempts to attack the economics of these deals by making it more difficult for inverted companies to access overseas earnings without triggering an additional tax burden in the United States. The Treasury Department also tightened current ownership rules that determine when the new corporation will be considered a non-U.S. company. The Treasury Department said that it is considering additional guidance “to address strategies that avoid U.S. tax on U.S. operations by shifting or ‘stripping’ U.S.-source earnings to lower tax jurisdictions, including through intercompany debt.” While there is no timeline issuing new rules on earnings stripping, the Treasury Department is soliciting input from the public on this issue. The NAM is also working to prevent the adoption of recent legislative proposals that would limit procurement opportunities by inverted companies. A September 8 letter from the NAM and the U.S. Chamber of Commerce emphasized that such proposals are contrary to U.S. international procurement obligations undertaken through both the World Trade Organization’s Government Procurement Agreement and in many of our free trade agreements. Details: Dorothy Coleman, (202) 637-3077. 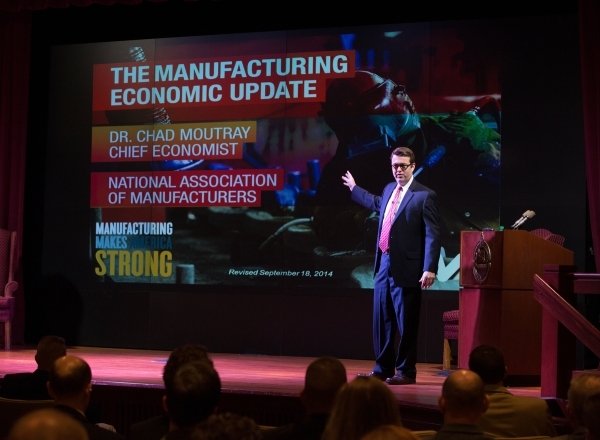 NAM Chief Economist Chad Moutray spoke about the manufacturing economy earlier this week to more than 300 military and civilian students at the National Defense University (NDU) at Fort McNair in Washington, D.C. Funded by the U.S. Department of Defense, NDU offers military education and training to members of the U.S. Armed Forces and select others in order to develop national security leaders and strategy. The NAM and manufacturers from across the United States, Puerto Rico and Canada will celebrate the third-annual Manufacturing Day on October 3. This coordinated effort is aimed at improving public perceptions of manufacturing and its rewarding career opportunities. Manufacturers are opening their doors to host plant tours, career workshops and other activities that engage their community. It’s not too late to register your event for October 3, or you can keep the momentum going with an event throughout October. For more information on Manufacturing Day and how to host or attend an event, click here. Join the Twitter conversation #MFGDay14. Details: Jeanine Arnett, (202) 637-3121. The Wall Street Journal featured our NAM D.A.T.A. Center event in San Francisco in a September 23 piece, titled “Intel Taps Internet of Things to Predict Shop Floor Tool Failure.” Verizon, Intel Corporation, Trimble and Teradata joined together to discuss the strong ties between manufacturing and technology. Click here for our Shopfloor blog series on the event. Details: Brian Raymond, (202) 637-3072. Politico, The Hill and The Business Journals reported this week that the NAM and other top business trade associations are engaged in nationwide efforts to increase voter registration and electoral participation among private-sector employees. To learn how to talk with your team members about the elections or to register to vote, please visit the NAM Election Center. We can make a difference. Details: Leann Paradise, (202) 637-3049. Politico reported on September 24 that NAM Vice President of Strategic Communications Lea Anne Foster is being named to Georgia Southern University’s Class of 2014’s “40 under 40,” highlighting her experience at the NAM, as chief communications advisor to Vice President Cheney and in the office of the late Sen. Paul Coverdell (R-GA). Details: Jamie Hennigan, (202) 637-3090. Details:Martha Sprague , (202) 637-3083. The House and Senate are in recess until November 12. Economic Reports: The Dallas Federal Reserve Bank will highlight manufacturing activity in its district on Monday, and the Conference Board will gauge consumer confidence on Tuesday. The main highlight next week will be new jobs data, with ADP estimating employment growth on Wednesday and the Bureau of Labor Statistics releasing official figures on Friday. Beyond these, other data points of interest next week include the latest figures on construction spending, factory orders, international trade and personal income and spending. Details: Chad Moutray, (202) 637-3148. Contact Senior Director, Executive Communications Laura Brown Narvaiz at lnarvaiz@nam.org.